The Fourth » It’s commandeering. Let’s have a pirate arc, I said. I’ll draw boats, I said! 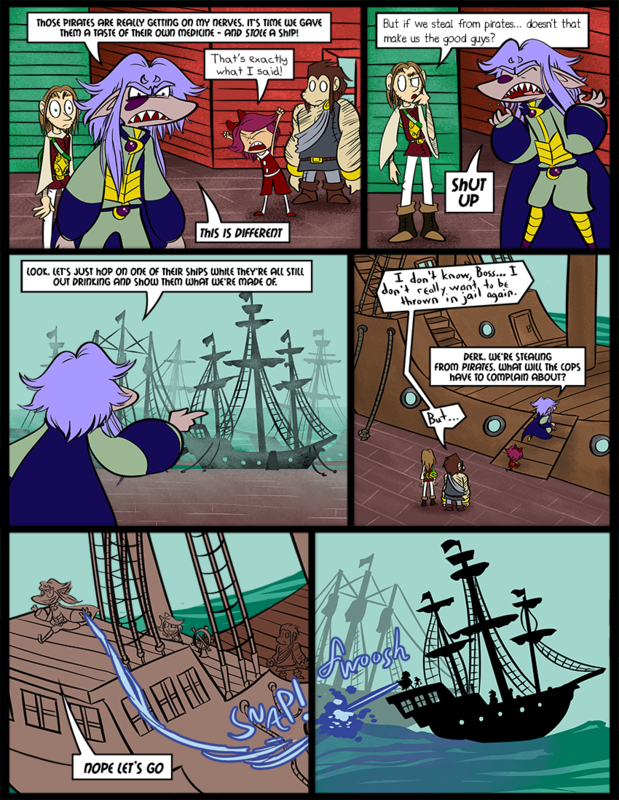 Stealing from pirates, what can possibly go wrong? One thing that can go wrong is that they may not be stealing from pirates. This is why you shouldn’t make impulse decisions. Huh, I didn’t know magic could be used like that. But I guess it makes sense–it is energy after all. So that’s what it was. I thought he was just blasting the other ship because, you know, evil. Also, if you steal from a pirate, you are still a thief. It really doesn’t matter who from, a thief is a thief. That’s totally going to be a navy ship. Yeah Cyril! Shut up! And being thieves is good – I mean evil! As long as they’re not those unwashed drunkard pirates. Best argument ever. I’ll have to use that next time I fight with my parents. The last panel looks like a deliciously awesome baby between DBZ and the part in Dracula where he crosses the ocean using his evil powers. Deliciously awesome baby? I wouldn’t normally describe a baby as delicious. Most of them taste horrible. he is never NOT all caps. Which is appropriate. um. are you making One Piece references? have u been working on being a dolobt machinist? Even if it isn’t a pirate ship, He’s the bad guy and bad guys do bad things like steal boats. So… yeah! There we go, an answer to everything! I forgot to mention, I went to go see/board a bunch of tall ships over the weekend. There were around 10-15 of them. It was really cool, but the lines were awful… I wore a blue Hawaiian shirt with flowers. captcha predicts that they will be sailing across ctocycl… sounds evil.